As the 2017 school year comes to a close, we are looking back at one of the most innovative programs run at St Patrick’s Technical College this year – the Century Engineering P-TECH collaboration. The College joined 13 other schools from around the country as part of the Australian Government’s $5.1 million P-TECH Australia pilot program. P-TECH brings industry and education institutions together to help students develop science, technology, engineering and maths (STEM) skills in a practical, real-world manner. The program aims to develop students’ knowledge within the STEM space as well as directly addressing industry needs and build future workforces. StPatsTech introduced two programs this year with a third coming online in 2018. 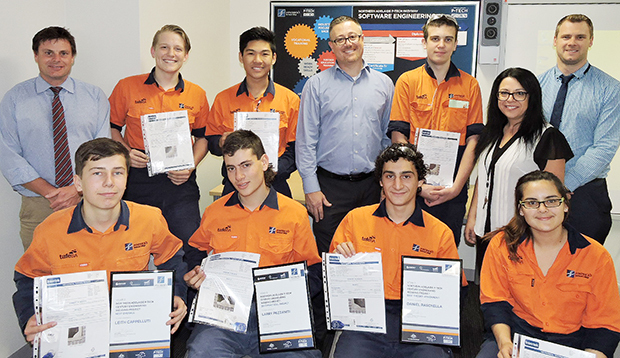 Defence Force contractor Century Engineering worked with Year 11 Engineering students to develop their welding skills to the Australian standards. 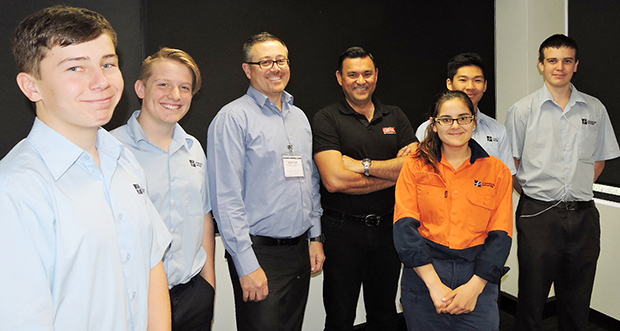 PMB Defence, which builds the batteries that power Australia’s fleet of Collins class submarines, worked with Electrotechnology students to develop their battery knowledge and system skills. Saab Australia, which operates in the advanced technology space with Adelaide’s defence sector, will mentor students from 2018 as part of the College’s new information technology course. Andrew Sinclair, Business Development Manager with Century Engineering, sat down with StPatsTech to talk about the engineering program he helped drive this year. “There is a skills shortage across the engineering trades and I hope programs like P-TECH can be part of the solution to address those needs,’’ Mr Sinclair said. “It’s a great advantage for students to engage with industry at an earlier stage such as from Year 11. “It’s also been very rewarding to see the students engage with the program and it was quite surprising how well they took in the information, especially in the practical stages. Mr Sinclair, who was Century Engineering’s main mentor for the program, said he also enjoyed working with the teachers and giving them a better knowledge of the industry. Describing his relationship with the College as “excellent”, Mr Sinclair said the flexibility and understanding of industry demands and timetables was a big element in the program’s first year success. 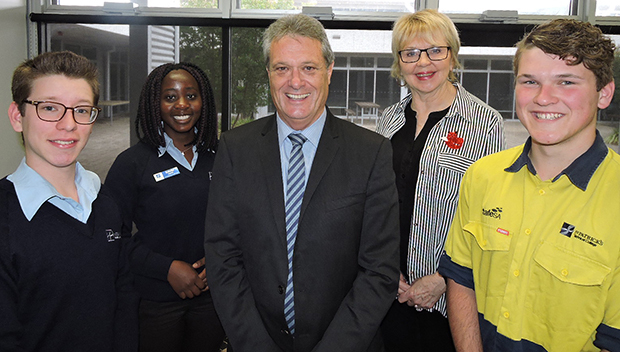 Northern Adelaide P-TECH Industry Liaison Officer, Toni Hartley, from the Skilling Australia Foundation, has been the bridge between the College’s teachers and industry to develop the three programs and hopes to see more roll out in the coming years. Ms Hartley praised Century Engineering for its commitment to the P-TECH program across the whole company from management to the workshop floor. “Century Engineering, along with StPatsTech’s other industry partners PMB Defence and Saab Australia, have shown a real commitment to their industries and the future workforce by investing their time and effort into developing P-TECH programs for South Australian youth,’’ Ms Hartley said. 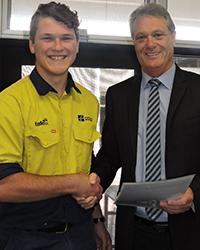 Major partner in the P-TECH program at StPatsTech is TAFE SA, which accredits the courses ensuring students are formally recognised for their skills. Ms Hartley said bringing students, industry and tertiary education together in one program helped students clearly see the pathways open to them in trade and technical careers. One of the core purposes of the P-TECH program is to demonstrate to students the vocational or apprenticeship pathway to higher education. 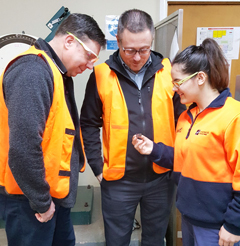 “We are working hard to ensure young people understand the many interesting, fulfilling, and financially rewarding career choices today’s tradesmen and women have, especially within the STEM sector,’’ she said. The Federal Department of Employment figures in December 2016 showed there was a skills shortage in South Australia in sheet metal trades workers and metal machinists (1st class). The Labour Market for Engineering Trades Workers in South Australia report said within engineering trades, only 66 per cent of vacancies in Adelaide were able to be filled because workers lacked experience and skills. This entry was posted in Industry Office, Latest News on 28/11/2017 by St Patrick's Technical College. Year 11 Engineering students recently learnt how critical it is for manufacturers to follow engineering designs as part of St Patrick’s Technical College’s P-TECH program. 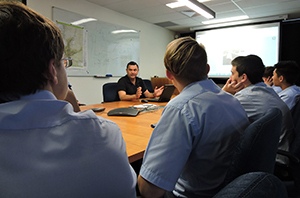 The students visited GPA Engineering in Unley and heard from Principal Civil / Structural Engineer, Amilcar Guerra, about the importance of engineering and design. The students were shown a number of case studies of poor design or manufacturing, which resulted in serious failures of infrastructure, and how and why the failures occurred. Mr Guerra, who has nearly 20 years’ experience in civil and structural engineering, told the students good engineers had a strong understanding of workshop practices and the technical skills required to create designs. He said collaboration between engineers and manufacturers was important to create safe, robust and efficient infrastructure. StPatsTech P-TECH partner, Century Engineering, arranged the visit to GPA. Century Engineering development manager Andrew Sinclair, who has been mentoring the students, also attended the meeting. 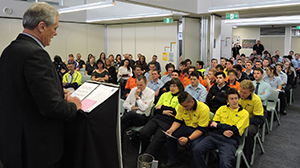 “In fabrication it is critical we follow the engineers’ drawings and get it right,’’ Mr Sinclair told the students. The Australian Government’s $5.1 million P-TECH pilot program has seen three employers partner with StPatsTech to help students realise pathways through science, technology, engineering and maths streams. These pathways can be through apprenticeships and vocational education or university and it is hoped the StPatsTech P-TECH program will help bridge skills gaps in Adelaide’s Defence industries. Along with Century Engineering, which is a heavy manufacturer for a number of Defence contracts, the College has partnered with PMB Defence, which designs and builds batteries for the Collins class submarine, and Saab Australia, Australia’s most experienced defence system company. This entry was posted in Industry Office, Latest News on 20/11/2017 by St Patrick's Technical College. St Patrick’s Technical College’s founding Principal addressed his final assembly at the school ahead of his retirement at the end of the year. Rob Thomas has been an educator for more than 40 years and played a pivotal role in the establishment of StPatsTech. Chair of StPatsTech College Board, Tricia Hicks, pay tribute to Mr Thomas’ contribution to the school. “On behalf of the board, I’d like to pay special tribute to Mr Rob Thomas,’’ Ms Hicks said. “For 11 and a half years he has tirelessly worked on your (the students’) behalf to help you achieve your own dreams. Principal Rob Thomas’ final assembly and presentation of Year 11 student awards. “I’ve enjoyed my time here immensely and meeting the many, many outstanding young people who give me great hope for the future,’’ Mr Thomas said. Student leader Santiago Bribiesca Diaz thanks Mr Thomas on behalf of the students. “Thank you for believing that we all deserve the best type of education possible. We wish you every happiness and good health in your retirement,” Santiago said. Current Thomas More College Deputy Principal, Danny Deptula, will take over the reins from January 2018. Also farewelled at the assembly were teachers, Chef Yvette Hull and College Coordinator, Marc Forster along with pre-foundation staff member, Jim Montgomery. Chef Hull is moving interstate with her family while Mr Forster has taken up the position of Deputy Principal at St Mark’s College in Port Pirie. Mr Montgomery, the College’s Industry Relations Manager, was involved in the initial submissions to establish a technical high school in Adelaide’s north in the mid-2000s. This entry was posted in Administration, Latest News on 16/11/2017 by St Patrick's Technical College.